The focus of this test case is the giveback procedure. This is the most critical part of the entire DR test as a synchronization needs to take place between plexes on both sites and finally the giveback command has to be executed. If there are any issues this is the point where it can bring your SiteA controller to its knees. Even if you manage to cripple a controller (as I did in the past) you can rest assured that your data is still alive and well on your SiteB site and will remain there until you get SiteA back online. This will most likely require the assistance of NetApp Support. 5.1 – Contact NetApp support on the support case opened earlier and advise of the current status of the environment. Follow their steps to return the system to original operation state. This is recommended practice from NetApp. The steps below should be carried out with NetApp Support supervision. You can perform the giveback yourself but I would recommend getting another set of eyes on things first. 5.8 – Run commands ‘show int brief’ on both switches and confirm Interswitch link connection is active. 5.12 – Verify that the plexes are synchronizing now that the disk shelves in SiteA are online. Run the command ‘aggr status -r mir’ to get a view of how the mirror synchronization is doing. 5.13 – Once resynchronization has completed between the sites, expected to take approx. 1 hour, plug in the Service Processor cable. Initially I got an error that I couldn’t perform a giveback due to CIFS users having files open. To resolve this I had to connect to SiteA via SSH and run the ‘cifs terminate‘ command and the re-run the giveback command. please make sure you have rejoined your aggregates before giveback. [SiteB:cf.fm.givebackStarted:notice]: Failover monitor: giveback started. [SiteB:cf.fm.givebackDuration:notice]: Failover monitor: giveback duration time is 11 seconds. [SiteB:cf.fsm.takeoverOfPartnerDisabled:notice]: Failover monitor: takeover of SiteA disabled (partner mailbox disks not accessible or invalid). [SiteB:cf.fsm.takeoverByPartnerDisabled:notice]: Failover monitor: takeover of SiteB by SiteA  disabled (unsynchronized log). [SiteB:cf.fsm.takeoverOfPartnerDisabled:notice]: Failover monitor: takeover of SiteA disabled (waiting for partner to recover). [SiteB:scsitarget.vtic.down:notice]: The VTIC is down. [SiteB:scsitarget.vtic.up:notice]: The VTIC is up. [SiteB:cf.fsm.takeoverOfPartnerDisabled:notice]: Failover monitor: takeover of SiteA disabled (partner booting). [SiteB:cf.fsm.takeoverOfPartnerDisabled:notice]: Failover monitor: takeover of SiteA disabled (unsynchronized log). [SiteB:cf.hwassist.recvKeepAlive:info]: hw_assist: Received hw_assist KeepAlive alert from partner(SiteA ). [SiteB:monitor.globalStatus.ok:info]: The system's global status is normal. 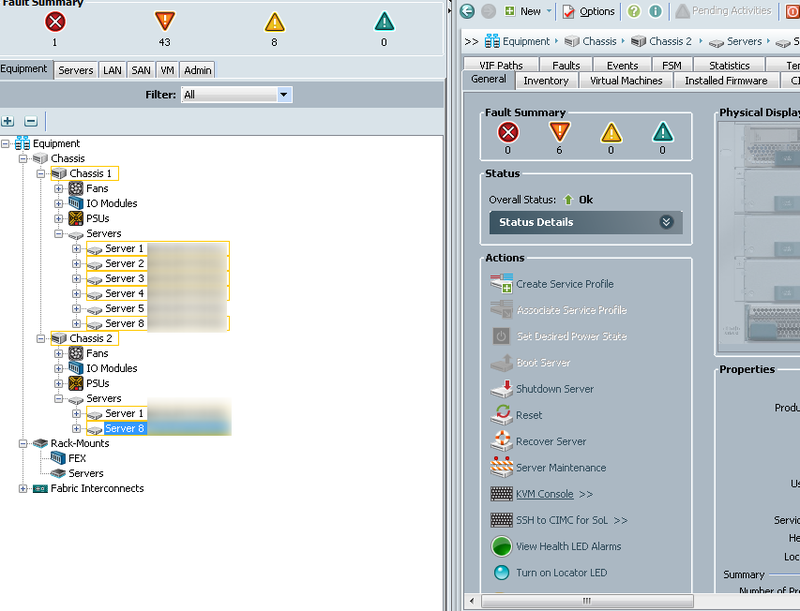 5.16 – Log into Cisco UCS Manager on both sites using admin account. There was one more step carried out after step 5 which I won’t cover here but it was just a precursory infrastructure health check. Another aspect not covered during the failover window involved application testing. These tests were to ensure that the critical applications were still online and working as expected from one controller. As it was a very specific application test relating to Documentum I have decided not to detail that here. During the failover window I would recommend running as many applications test as possible. This DR test just covered the failover from one site to another and not vice-versa. A decision was made to test just one-way failover as the opposite site had been failed over as part of a previous DR test. While that test has a number of issue it still succeeded in reaching its RPO and RTOs and was then used as a foundation for the test covered in the above steps. The only way to really perform a DR test for MetroCluster is to put your system in a proper failure scenario, performing a component by component failure will break your MetroCluster. It’s designed to handle component failures but like any equipment it has a limit. MetroCluster by its very nature is a disaster-avoidance infrastructure. As components fail or are taken offline the smarts in the controllers handle this with grace. It’s so good at handling component failures that it actually needs to have the power pulled in one site in order to run a DR test. I’ve always wanted to pull the power on a storage unit but was always worried about bringing it back online afterwards. I was still worried during this test but it all proved to be okay in the end. The actual failover time, excluding the initial health checks etc, from when the ‘cf forcetakeover -d‘ command was run took just 34 minutes. During this process the IP address for the shutdwon controller came online and all the volumes in the remote site Plexes were converted into read/write volumes. The failback time took a total of 57 minutes. This was made up of 45 minutes to resync the aggregrate mirrors and just 12 minutes to complete the ‘cf giveback‘ process. There was no data loss during this period and RPO was so small it was immeasurable. Consider I was working against RPO of 24 hours and RTO of 2 days, which may seem generous but not when the whole infrastructure is taken into account, then the outcomes from the test really showed the management team that the money spend on highly-available stretched infrastructure was worth it. The last thing to remind you of before wrapping up is to make sure that the SP is disconnected from the site you are going to shutdown otherwise you will see some unexpected issue. In the event of a real DR the hardware assist would kick in and the failover process wouldn’t be as manually intensive. Also, if we’re honest you’ll be on the phone to NetApp support to get assistance on what steps to perform next anyway. I don’t know how useful this procedure will be to anyone else but when I was looking for information on how to perform a MetroCluster failover there was a serious scarcity. Hopefully somebody else that will be performing a similar test will find it useful and that it will help them to avoid mistakes I made in my first DR test. NetApp MetroCluster is a really cool piece of technology and if you can get your hands on it then I’d recommend it, if for no other reason than to know that your data is safe. This entry was posted in MetroCluster, Netapp and tagged 7-Mode, 7-Mode MetroCluster, DR Failover Test, MetroCluster DR, NetApp, NetApp MetroCluster. Bookmark the permalink. Your DR test is well written but you’re missing a step ! When you power on the disaster site, the resync is only for the aggregates of the survival site. In order to resync the aggregate of the disaster site, you must mirror them again with the command “fasSiteB/FasSiteA>aggr mirror aggr0 -v aggr0(1)” (for example in case of use of aggr0 as aggregate name) and only after the resync is complete for both aggregates of both site you can power on the node and initiate the giveback. Thanks for pointing that out. I just checked back on my documentation and I did have the mirror commands there. I’ve updated the steps in the post to show that. Regarding powering on the storage controller. I agree that it should be after the mirrors have re-synchronized but during my DR test I had NetApp support on line at the time and they advised to power on the controller at the point I’ve specified in the steps. The documentation from NetApp does mention to do it after the re-sync has completed. I’ve added a note to the article about this. Thanks for reading the article and providing feedback.